Fork & Salad Welcomes YOU in Kahului!! One of the best things about Central Maui is how, well, central it is, being accessible to and from so many parts of the island. And “accessible” is a word we use when describing our mission: to get farm-to-table cuisine into the hands (and mouths!) of more people, through convenience, affordability, quality products and local support. Our Kahului eatery is going strong, after opening on June 1, 2018 at 120 Ho’okele Street #330 in the Pu‘unēnē Shopping Center. We love this location, and are grateful to be surrounded by thriving neighbors like Target, Starbucks and Petco!! As you’ll see in our video above, our June 1st grand opening featured a very moving Hawaiian blessing by Kimokeo Kapahulehua, and a meet-and-greet with supplier Kumu Farms. Our newest locale spans 1,400 square feet, comfortably seating more than 20 guests in a state-of-the-art, custom-designed space. You’ll find step-by-step instructions built into our vibrant wall collage to help make ordering a snap! 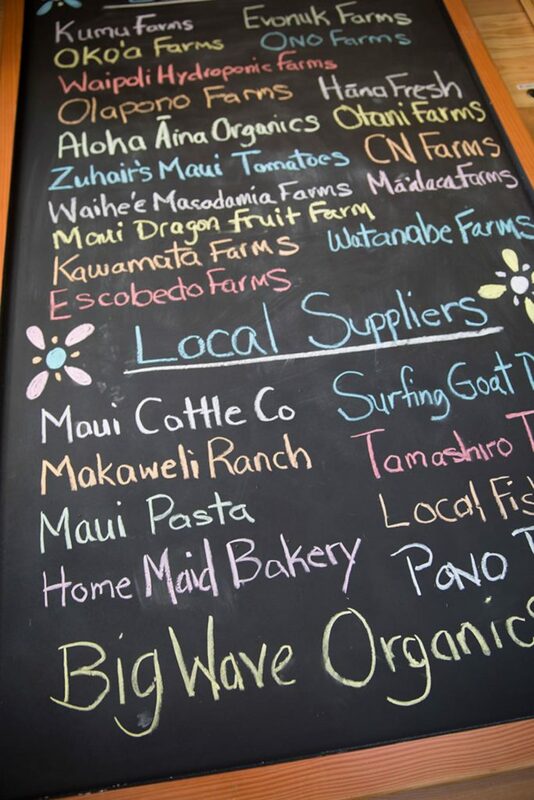 You can enjoy the same healthy and fresh menu items available at the Azeka Mauka location in Kīhei, including build-your-own options, signature salads, a range of sandwiches, gluten-freeitems, kombucha on draft, and much more. Our new Kahului store also has the same hours, from 10:30 a.m. to 9 p.m. daily, and offers take-out and pick-up options via phone ordering or the free Fork & Salad mobile app. Also in our video, you’ll hear a little about the vision for mainland expansion and exclusive partnership with Fransmart, the industry-leading franchise development company behind the success of household concepts like The Halal Guys and Five Guys Burgers & Fries. Get more details on Fork & Salad franchise opportunities here. It was an evening of gratitude, ‘ohana and loads of fresh produce at Fork & Salad! Hundreds shared in our Grand Opening celebration during Kīhei’s 4th Friday on August 26, 2016. We were so moved by the powerful Hawaiian blessing, led by Kumu Kimokeo Kapahulehua. In addition, Fork & Salad featured food specials, free kombucha samples, a mini-farmers market and beer garden! Our charitable partner Grow Some Good was also on-hand with seed packets and great community outreach. And you can enjoy yet another beer garden on our outdoor patio and farmers market right outside our restaurant at Kīhei’s 4th Friday on September 23 at from 6 to 9 p.m. In this video, take a look at what the special night meant to us, including a look back at how it all began!